This is a high capacity mobile humidifier with lots of features that make it ideal for use in museums, galleries, archives and other public places. 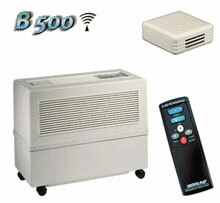 It's an evaporative humidifier for rooms up to 1,000m. All functions are controlled solely via a remote control making the unit tamper-proof once programmed. A wireless sensor is attached to a wall up to 30m away with a velcro strip and transmits current room humidity back to the humidifier giving precise humidity control. This remote unit operates with batteries and emits a warning signal as soon as they need changing. Water is held in a basin at the bottom of the unit and pumped to the top of the humidifier to be evenly distributed down through a filter that runs around its sides. Dry air is sucked in through these moist filters and blown back out of the top of the unit, optimially humidified and filtered. The unit's 50 litre water tank is filled manually. Once you have filled the B500, set the humidistat and select the fan speed using the remote control. The B500's fan has four manual settings and one automatic mode in which the fan is regulated up or down by the output requirement dictated by the sensor. The humidifier contains a UV sterilisation lamp that keeps the water in the system hygienically clean. A lime conversion cartridge also treats the water so that limescale build-up is reduced inside the humidifier. The digital display gives information on current room humidity, operating status, water fill level, fan speed, filter change display and its self-diagnostic system.